This low-key, beachy archipelago, which is sandwiched between the mainland and Canada's Vancouver Island, feels like a world away. But in reality, it's only a short (hour-plus) ride on the car ferry from Anacortes, Washington. The ferry stop of Friday Harbor on San Juan Island is the best-known town and has the most services, making it a great base for families. 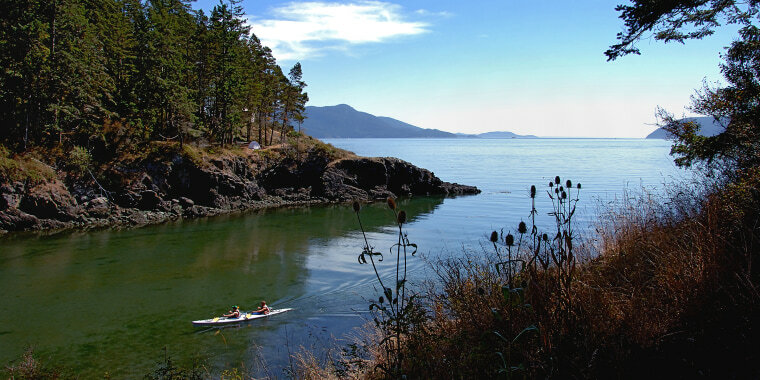 The San Juans are synonymous with whale watching, and during summer and early fall, you can often spot breaching orcas near the shoreline of Lime Kiln State Park, on San Juan Island's west side. Kids ages eight and up are eligible for the San Juan Island Zip Tour; the staff will pick you up in Friday Harbor and bring you to their course in the forest, where you'll complete a total of 8 traverses through the Douglas Fir canopy, including one over a lake. If you get the urge to explore beyond San Juan Island, ferry over to Orcas Island, which is even sleepier and more pastoral. Moran State Park on Orcas is home to freshwater lakes, waterfalls and Mount Constitution, the islands' highest peak (you can drive to the top). From the stone observation tower, you can see all the way to Mount Baker on the mainland. The Earthbox Inn & Spa in Friday Harbor describes its vibe as "motor inn chic," and it fits. The decor mixes lots of soothing neutrals and light wood tones, and families will appreciate the Sea Place rooms, which have extra square footage and kitchenettes. The hotel also has an on-site day spa, jacuzzi, dry sauna and the island's only indoor pool. Part of the fun of staying at the 82-acre Lakedale Resort is picking your room type. There are traditional lodge rooms, Airstream trailers, yurts, canvas tents with furniture (for an in-between glamping experience), and camp sites (both forest and lakeside). If you love to camp but can't deal with lugging gear, you can book a "Camping EZ" package at Lakedale, and the staff will set up REI tents, cots and camp chairs before you arrive. The property has three freshwater lakes, so it's possible to swim, fish and canoe without even having to pull out your car. If you're planning a day of explorations, the Market Chef in Friday Harbor is the quintessential picnic-lunch pickup stop; recent menu items included brisket sandwiches, quinoa and black bean salad and buttermilk fried chicken. Van Go's Pizza in Friday Harbor is run by Dutch chef Daniel Van Hamersfeld whose delicious pies range from basic (cheese and pepperoni) to more distinctive (Brussels sprouts and bacon). Go before the dough runs out (it happens!) and don't miss the cozy patio.